1978 Ideal Tuesday Taylor doll, close-up of the beautiful facial features, this is the Super Model version which also came as black doll named Taylor Jones, she's shown below on the box graphics. 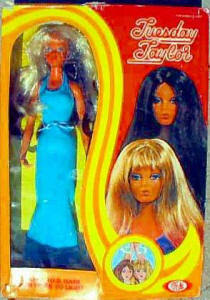 Suntan dolls were available in 1977-1978 (they tanned when exposed to Sun). Tuesday's boyfriend is one of these and is 12" tall named Eric, her little sister is Dodi at 9" tall. Tuesday Taylor a white doll and Taylor Jones a black doll, are both vinyl fashion dolls 11 1/2" tall, with rooted hair, eyelashes, painted eyes, non-bendable arms and legs. You can turn the top of her hair cap and it flips from (Tuesdays hair) sun streaked blond to dark brown. Both dolls are wearing a full length aqua halter style, fitted dress and white open toe heels. 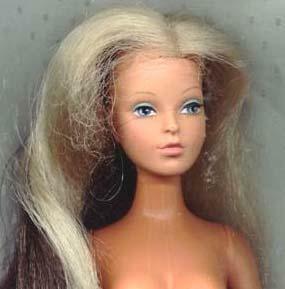 The Tuesday Taylor doll mark: ©1975 IDEAL H-248 Hong Kong on neck. We have found a Summer, Winter vinyl vacation house for Tuesday, it changes from a two-story ski chalet to an A-Frame beach house, so there maybe other vinyl products, too. The first year they had six separate outfits, by 1977 thirty outfits were issued, outfits are tagged - IDEAL Tuesday Taylor. Don't confuse this with the earlier Ideal Tiffany Taylor doll 19" tall, that's another Ideal doll who shares the same flip style hair feature as Tuesday. 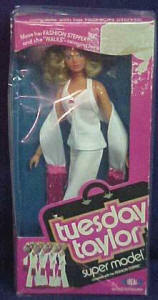 You can see in the graphic Taylor Jones is pictured (top doll with black hair) along with Tuesday below her. Marked; © 1964 Ideal Toy Corp. DO-9-E on neck. This doll has a "fashion stepper" that you place her on with magnetic shoes, to make her "walk". Also came in a black doll version named Taylor Jones. Marked: © 1977 IDEAL H-293 HONG KONG on neck.